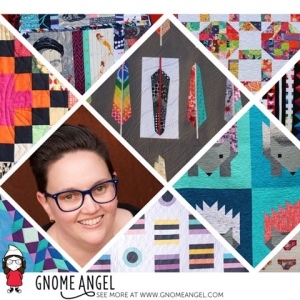 Podcast Episode 33 – Interview featuring Angie Wilson from Gnome Angel. Angie lives in the capital of Australia, Canberra, with her very understanding husband and her curious son. Angie is a passionate creative who loves fabric the way that Carrie Bradshaw loves shoes. She’s got a weakness for trashy television, processed sugar and hugs from her boys. Angie’s got a strong aversion to deadlines and works best under the pressure of looming failure.